I came across a comment in my blog about the horrors I encountered with JRS Contractors which says that Jackie Salas renamed her company as Furniture Fair Station. They have a new sulit.com.ph account set up two days ago (as of this writing). I know there is an ongoing complaint case filed at the DTI against the people behind JRS Contractors, particularly Jackie Salas and her co-horts Nikka and Owen. Naturally, she eventually got rid of the tainted name of "JRS Contractors" and re-emerge as Furniture Fair Station. I wouldn't be surprised if I won't see the name "Jackie Salas" in the DTI registry for Furniture Fair Station but definitely the "new" company is still operated by the same people who duped a lot of customers. I hope potential customers who are interested in the products of Furniture Fair Station will see this blog and that of JRS Contractors. This is a warning for possible victims that FURNITURE FAIR STATION AND JRS CONTRACTORS ARE RUN BY THE SAME PEOPLE! This is their contact details as stated in their sulit.com.ph page. Just click one for their ads and you'd see the contact details at the bottom part of the ad. Nikka was mentioned in one of the complaints on JRS in my previous blog entry. The above address is the same used by JRS Contractors. I got this from their suspended account from sulit.com.ph. We ordered a bed frame, nightstand and 2 seater dining set from JRS Contractors. We chose from the designs they posted in their multiply site: particularly the Gumila bed, Bexhill dining set and 1 nightstand which came with the Gumila bed. We went to their Mandaluyong office to pay 50% deposit for our order. Upon ordering, we were assisted by one of their staff and we selected our orders in their office computer. We were advised by Jackie Salas of JRS Contractors (same as JRS Furnitures) that an order will take around a week to finish. She also told us that the furnitures we ordered were "ready made" contrary to what we thought as "made to order." Thus, it is just safe to assume that our orders will be delivered faster than expected of a "made to order" or custom made furniture. Xtremely Xpresso: surely for the xtremely hungry! We spent one long weekend at the Subic Yacht Club with friends and our children in tow. And with kids who yell "FOOD!" and "HUNGRY!" every once in a while, one great place to satisfy everyone's appetite in Subic would be Xtremely Xpresso. Xtremely Xpresso is a coffee shop but they are known for their gigantic pizza. Their small being 14 inches in diameter---yep, you read it right, it's their smallest size, while their largest is a whopping 22 inches!!! 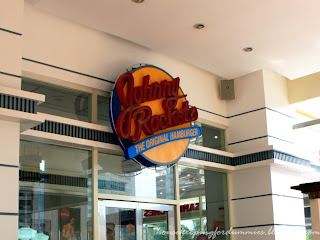 Johnny Rockets in Anaheim marked the venue of my first time to drink a malt shake. During my brief stint in California, I made a mental list of food I'd like to try out, usual U.S. fares that I only get to see in the movies and in Archie comics---stuffs like chinese takeout, Ben and Jerry's ice cream and malt shake. Mr. Lee's phad thai (left) & another phad thai in one of Suan Lum market food stalls (right). Both are from our Bangkok trip last year. Absence makes the tongue grow fonder. Nope, the above statement is not a typo error. After tasting authentic phad thai in Bangkok last year, I've been craving to taste another one here in Manila. I've tried several Thai restaurants in the metro, like Som's---all boasting to serve authentic phad thais. But alas, all failed to meet this phad thai hunter's expectations.